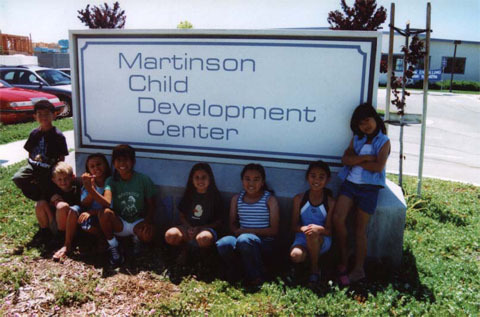 For over 35 years, the Martinson Child Development Center has provided quality, affordable childcare services to the families in Alviso, Santa Clara, and neighboring communities. Since it began as Alviso Day Care in 1969, Martinson Child Development Center (MCDC) has grown and has expanded beyond its founding mission of providing subsidized childcare for low-income families. The Center now provides both subsidized and non-subsidized care, serving all families in the community that are in need of quality child care. In order to continue meeting that need, MCDC's leadership has initiated a Capital Development Campaign to create an endowment fund that will provide a financial foundation for the future of the Center. As its primary mission, Martinson Child Development Center provides state-subsidized childcare for working, low-income families of Alviso, Santa Clara, San Jose and neighboring communities. Professional, credentialed teachers provide creative, fun, and developmentally appropriate activities promoting motor, social, language, and conceptual skills. A full day, year-round program focused on motor, social, and emotional development, and including age-appropriate math, science, cooking, art, music, and dramatic arts. Serving children from 3 to 5 years old. A curriculum including homework help, reading assistance, arts and crafts, and other school-age activities. Serving pre-school to fifth grade in the Santa Clara Unified School District. A camp-like program that includes arts and crafts, aquatic activities, sports, games and picnics. Serving elementary school children during public school holidays and summer. Providing parents and families with free, on-site classes and workshops on parenting skills, stress management, nutrition, childcare legislation, and related topics. On-site counseling services, and referrals to other appropriate public and private social service agencies such as Department of Social Services and the Public Health Department. For serious problems involving housing, child abuse or neglect, alcohol or drug abuse, or other factors leading to the immediate endangerment of an enrolled family, referrals are made to appropriate agencies and authorities. MCDC is the area's largest provider of subsidized childcare. In order to receive state-subsidized childcare, parents must meet stringent income requirements set by the State of California. The majority of families at MCDC receive subsidized care, and those that do not qualify benefit from very reasonable standard rates. The Martinson Child Development Center Capital Development Campaign is focused on creating an endowment fund that will provide investment income for the Center. This income will be used to address the specific immediate and long-term financial requirements listed below, and will help insure the long-term financial viability of the Center. MCDC operates under a contract with the State of California that pays a fixed sum to the Center in return for providing a fixed number of days of childcare for subsidized children. Traditionally, the Center provides many more days of childcare than the State requires, but receives no additional payment. For many years this difference was covered by agencies like United Way and other local agencies, but since the late 1990's that funding has diminished each year. The Center owes monthly lease payments to the City of Santa Clara. While the terms of the current lease are very favorable, the endowment will provide flexibility should market conditions force terms that are less advantageous in the future. Nearly every member of the staff is a credentialed professional, and many have been with the Center for 10 or even 15 years. The endowment will enable the Center to keep salaries more competitive, and to recruit and retain qualifies staff. The Martinson Child Development Center Capital Development Campaign will create an endowment fund to provide a financial foundation for the future of the Center. We look forward to working with the community to ensure that the Martinson Child Development Center will always be here for the children of out community. The Martinson Child Development Center is a 501(c)(3) charitable organization.